Redshirt-junior setter Gina Furlin jumps to set the ball to teammate Allie Hueston in a match against Green Bay in August 2017. 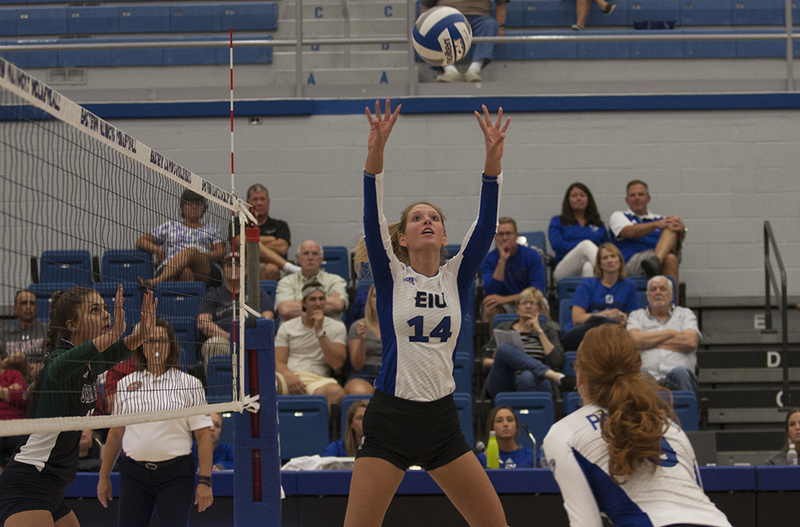 The Eastern volleyball team will contend against Illinois State, Butler and Auburn in the Butler Bulldogs Tournament this weekend, touching off an eight-game road trip. At the Panther Invitational last weekend, Eastern lost the first set in three of the four matches it played. The Panthers did, however, advance to win one of those three games. “It was a great opportunity for us to learn about ourselves as well as take that opportunity to get better this week, and prepare us so we can come back and fight and not lose a set,” Julie Allen, the Eastern women’s volleyball coach, said. Junior Maggie Runge, whose invitation to join the All-Tournament team marked the third time in which she received the accolade, posted 23 kills and blocks apiece. Sophomore Laurel Bailey and Senior Taylor Smith both earned double doubles at the tournament. For its first game this weekend on Friday, Eastern will play Illinois State, a team with a 2-1 record this season. Defeating Furman, Coastal Carolina and Georgia through three games, Illinois State coughed up fewer service errors than its opponents, who registered 1.8 service errors relative to the Cardinals’ .9. The Redbirds covet a 23-1 all-time record against the Panthers, but the last confrontation between the two teams, a 3-0 Illinois State win, occurred in 2007. Eastern’s second tournament opponent, Butler, will face the Panthers on Saturday. Butler has operated on an 0-3 mark to crack open the season, none of them against conference teams, swallowing its worst start since 2011. A Butler sophomore, outside hitter Natalie Ravenell, was distinguished as a member of the Panther Challenge All-Tournament team, being recognized for her 27 kills and .260 attack percentage. Butler’s 6-2 Redshirt freshman, Melody Davidson, has designed the Bulldogs’ defensive edge, one characterized by 15 blocks thus far, sufficient for the third-highest in the Big East Conference. Among Big East volleyball programs, Butler possesses the worst record. To conclude the Butler Invitational, Eastern is lined up against Auburn. After its win over Highpoint University last Friday, Auburn crumbled with a 3-0 loss to Michigan the following day. Tiger senior Brenna McIlroy and sophomore Anna Stevenson have enjoyed 19 and 18 kills, respectively.